thirteen banks got 8.5 trillion from us GOV taxpayers, and none of them have done or will ever do anything for those taxpayers. They could sink and the economy would be no different. "Thirteen banks control the US GOV. They do nothing for the American people. an online book on this matter, described below here. Over the last 50 years, the FAA, the airline manufacturers, and the airlines worked together to make a highly complex air travel system more efficient and much safer. If you’ve ever wondered why, in contrast, our financial regulators and banks made our financial system less efficient and much more dangerous, you should read this book. 13 Banks". Excerpt from famous book that captures the tone of the BIG BANKER. My administration is the only thing between you bankers and the pitchforks. —Barack Obama, March 27, 2009 day he gave them the money. What a way to reward the thieves, the banksters, plus Obama never prosecuted one of them. Despite three government bailouts, Citigroup stock was trading below $3 per share, about 95 percent down from its peak; stock in Bank of America, which had received two bailouts, had lost 85 percent of its value. The public was furious at the recent news that American International Group, which had been rescued by commitments of up to $180 billion in taxpayer money, was paying $165 million in bonuses to executives and traders at the division that had nearly caused the company to collapse the previous September. The Obama administration’s proposals to stop the bleeding, initially panned in February, were still receiving a lukewarm response in the press and the markets. Prominent economists were calling for certain major banks to be taken over by the government and restructured. Wall Street’s way of life was under threat. What did that mean, “we’re all in this together”? It was clear that the thirteen bankers needed the government. Only massive government intervention,(in the form of direct investments of taxpayer money, government guarantees for multiple markets, practically unlimited emergency lending by the Federal Reserve, and historically low interest rates) had prevented their banks from following Bear Stearns, Lehman Brothers, Merrill Lynch, Washington Mutual, and Wachovia into bankruptcy or acquisition in extremis. But why did the government need the bankers?CUI F'N BONUM? Any modern economy needs a financial system, not only to process payments, but also to transform savings in one part of the economy into productive investment in another part of the economy. However, the Obama administration had decided, like the George W. Bush and Bill Clinton administrations before it, that it needed this financial system— a system dominated by the thirteen bankers who came to the White House in March. Their banks used huge balance sheets to place bets in brand-new financial markets, stirring together complex derivatives with exotic mortgages in a toxic brew that ultimately poisoned the global economy. In the process, they grew so large that their potential failure threatened the stability of the entire system, giving them a unique degree of leverage over the government. Despite the central role of these banks in causing the financial crisis and the recession, Barack Obama and his advisers decided that these were the banks the country’s economic prosperity depended on. And so they dug in to defend Wall Street against the popular anger that was sweeping the country— the “pitchforks” that Obama referred to in the March 27 meeting. To his credit, Obama was trying to take advantage of the Wall Street crisis to wring concessions from the bankers— notably, he wanted them to scale back the bonuses that enraged the public and to support his administration’s plan to overhaul regulation of the financial system. But as the spring and summer wore on, it became increasingly clear that he had failed to win their cooperation. As the megabanks, led by JPMorgan Chase and Goldman Sachs, reported record or near-record profits (and matching bonus pools), the industry rolled out its heavy artillery to fight the relatively moderate reforms proposed by the administration, taking particular aim at the measures intended to protect unwary consumers from being blown up by expensive and risky mortgages, credit cards, and bank accounts. In September, when Obama gave a major speech at Federal Hall in New York asking Wall Street to support significant reforms, not a single CEO of a major bank bothered to show up. If Wall Street was going to change, Obama would have to use (political) force. Why did this happen? Why did even the near-collapse of the financial system, and its desperate rescue by two reluctant administrations, fail to give the government any real leverage over the major banks? By March 2009, the Wall Street banks were not just any interest group. Over the past thirty years, they had become one of the wealthiest industries in the history of the American economy, and one of the most powerful political forces in Washington. Financial sector money poured into the campaign war chests of congressional representatives. Investment bankers and their allies assumed top positions in the White House and the Treasury Department. Most important, as banking became more complicated, more prestigious, and more lucrative, the ideology of Wall Street— that unfettered innovation and unregulated financial markets were good for America and the world—became the consensus position in Washington on both sides of the political aisle. Campaign contributions and the revolving door between the private sector and government service gave Wall Street banks influence in Washington, but their ultimate victory lay in shifting the conventional wisdom in their favor, to the point where their lobbyists’ talking points seemed self-evident to congressmen and administration officials. Of course, when cracks appeared in the consensus, such as in the aftermath of the financial crisis, the banks could still roll out their conventional weaponry— campaign money and lobbyists; but because of their ideological power, many of their battles were won in advance. The political influence of Wall Street helped create the laissez-faire environment in which the big banks became bigger and riskier, until by 2008 the threat of their failure could hold the rest of the economy hostage. That political influence also meant that when the government did rescue the financial system, it did so on terms that were favorable to the banks. What “we’re all in this together” really meant was that the major banks were already entrenched at the heart of the political system, and the government had decided it needed the banks at least as much as the banks needed the government. So long as the political establishment remained captive to the idea that America needs big, sophisticated, risk-seeking, highly profitable banks, they had the upper hand in any negotiation. Politicians may come and go, but Goldman Sachs remains. The Wall Street banks are the new American oligarchy— a group that gains political power because of its economic power, and then uses that political power for its own benefit. Runaway profits and bonuses in the financial sector were transmuted into political power through campaign contributions and the attraction of the revolving door. But those profits and bonuses also bolstered the credibility and influence of Wall Street; in an era of free market capitalism triumphant, an industry that was making so much money had to be good, and people who were making so much money had to know what they were talking about. Money and ideology were mutually reinforcing. This is not the first time that a powerful economic elite has risen to political prominence. In the late nineteenth century, the giant industrial trusts— many of them financed by banker and industrialist J. P. Morgan— dominated the U.S. economy with the support of their allies in Washington, until President Theodore Roosevelt first used the antitrust laws to break them up. 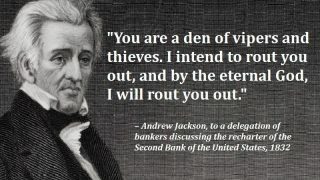 Even earlier, at the dawn of the republic, Thomas Jefferson warned against the political threat posed by the Bank of the United States. In the United States, we like to think that oligarchies are a problem that other countries have. The term came into prominence with the consolidation of wealth and power by a handful of Russian businessmen in the mid-1990s; it applies equally well to other emerging market countries where well-connected business leaders trade cash and political support for favors from the government. But the fact that our American oligarchy operates not by bribery or blackmail, but by the soft power of access and ideology, makes it no less powerful. We may have the most advanced political system in the world, but we also have its most advanced oligarchy. In 1998, the United States was in the seventh year of an economic boom. Inflation was holding steady between 2 and 3 percent, kept down by the twin forces of technology and globalization. Alan Greenspan, probably the most respected economist in the world, thought the latest technology revolution would allow sustained economic growth with low inflation: “Computer and telecommunication based technologies are truly revolutionizing the way we produce goods and services. This has imparted a substantially increased degree of flexibility into the workplace, which in conjunction with just-in-time inventory strategies and increased availability of products from around the world, has kept costs in check through increased productivity.” Prospects for the American economy had rarely seemed better. But Brooksley Born was worried. She was head of the Commodity Futures Trading Commission (CFTC), the agency responsible for financial contracts known as derivatives. In particular, she was worried about the fast-growing, lightly regulated market for over-the-counter (OTC) derivatives— customized contracts in which two parties placed bets on the movement of prices for other assets, such as currencies, stocks, or bonds. Although Born’s agency had jurisdiction over certain derivatives that were traded on exchanges, it was unclear if anyone had the authority to oversee the booming market for custom derivatives. In 1998, derivatives were the hottest frontier of the financial services industry. Traders and salesmen would boast about “ripping the face off ” their clients— structuring and selling complicated deals that clients did not understand but that generated huge profits for the bank that was brokering the trade. Even if the business might be bad for their clients, the top Wall Street banks could not resist, because their derivatives desks were generating ever-increasing shares of their profits while putting up little of the banks’ own capital. The global market for custom derivatives had grown to over $70 trillion in face value (and over $2.5 trillion in market value)† from almost nothing a decade before. The derivatives industry had fought off the threat of regulation once before. In 1994, major losses on derivatives trades made by Orange County, California, and Procter&Gamble and other companies led to a congressional investigation and numerous lawsuits. The suits uncovered, among other things, that derivatives salesmen were lying to clients, and uncovered the iconic quote of the era, made by a Bankers Trust employee: “Lure people into that calm and then just totally f——’em.” Facing potential congressional legislation, the industry and its lobbying group fought back, aided by its friends within the government. The threat of regulation was averted, and the industry went back to inventing ever more complex derivatives to maintain its profit margins. By 1997, the derivatives business even had the protection of Greenspan, who said: “[T]he need for U.S. government regulation of derivatives instruments and markets should be carefully re-examined. The application of the Commodity Exchange Act to off-exchange transactions between institutions seems wholly unnecessary--- private market regulation appears to be achieving public policy objectives quite effectively and efficiently.” In other words, the government should keep its hands off the derivatives market, and society would benefit. Ultimately, Summers, Rubin, Greenspan, and the financial industry won. Born issued the concept paper in May, which did not cause a financial crisis. But Congress responded in October by passing a moratorium prohibiting her agency from regulating custom derivatives. In 1999, the President’s Working Group on Financial Markets— including Summers, Greenspan, SEC chair Arthur Levitt, and new CFTC chair William Rainer— recommended that custom derivatives be exempted from federal regulation. This recommendation became part of the Commodity Futures Modernization Act, which President Clinton signed into law in December 2000. We don’t know which thirteen bankers were meeting with the deputy treasury secretary when he called Brooksley Born; nor do we know if it was actually twelve or fourteen bankers, or if they were in his office at the time, or if Summers was actually convinced by them—more likely he came to his own conclusions, which happened to agree with theirs. (Summers did not comment for the Washington Post story that reported the phone call.) Nor does it matter. What we do know is that by 1998, when it came to questions of modern finance and financial regulation, Wall Street executives and lobbyists had many sympathetic ears in government, and important policymakers were inclined to follow their advice. Finance had become a complex, highly quantitative field that only the Wall Street bankers and their backers in academia (including multiple Nobel Prize winners) had mastered, and people who questioned them could be dismissed as ignorant Luddites. No conspiracy was necessary. Even Summers, a brilliant and notoriously skeptical academic economist (later to become treasury secretary and eventually President Obama’s chief economic counselor), was won over by the siren song of financial innovation and deregulation. By 1998, it was part of the worldview of the Washington elite that what was good for Wall Street was good for America. The aftermath is well known. Although Born’s concept paper did not cause a financial crisis, the failure to regulate not only derivatives, but many other financial innovations, made possible a decade-long financial frenzy that ultimately created the worst financial crisis and deepest recession the world has endured since World War II. Free from the threat of regulation, OTC derivatives grew to over $680 trillion in face value and over $20 trillion in market value by 2008. Credit default swaps, which were too rare to be measured in 1998, grew to over $50 trillion in face value and over $3 trillion in market value by 2008, contributing to the inflation of the housing bubble; when that bubble burst, the collapse in the value of securities based on the housing market triggered the financial crisis. The U.S. economy contracted by 4 percent, financial institutions took over one trillion dollars of losses, and the United States and other governments bailed out their banking sectors with rescue packages worth either hundreds of billions or trillions of dollars, depending on how you count them. Brooksley Born was defeated by the new financial oligarchy, symbolized by the thirteen bank CEOs who gathered at the White House in March 2009 and the “thirteen bankers” who lobbied Larry Summers in 1998. The major banks gained the wealth and prestige necessary to enter the halls of power and sway the opinions of the political establishment, and then cashed in that influence for policies— of which derivatives nonregulation was only one example— that helped them double and redouble their wealth while bringing the economy to the edge of a cliff, from which it had to be pulled back with taxpayer money. The choices the federal government made in rescuing the banking sector in 2008 and 2009 also have significant implications for American society and the global economy today. Not only did the government choose to rescue the financial system— a decision few would question— but it chose to do so by extending a blank check to the largest, most powerful banks in their moment of greatest need. The government chose not to impose conditions that could reform the industry or even to replace the management of large failed banks. It chose to stick with the bankers it had. In the dark days of late 2008—when Lehman Brothers vanished, Merrill Lynch was acquired, AIG was taken over by the government, Washington Mutual and Wachovia collapsed, Goldman Sachs and Morgan Stanley fled for safety by morphing into “bank holding companies,” and Citigroup and Bank of America teetered on the edge before being bailed out— the conventional wisdom was that the financial crisis spelled the end of an era of excessive risk-taking and fabulous profits. Instead, we can now see that the largest, most powerful banks came out of the crisis even larger and more powerful. When Wall Street was on its knees, Washington came to its rescue— not because of personal favors to a handful of powerful bankers, but because of a belief in a certain kind of financial sector so strong that not even the ugly revelations of the financial crisis could uproot it. That belief was reinforced by the fact that, when the crisis hit, both the Bush and Obama administrations were largely manned by people who either came from Wall Street or had put in place the policies favored by Wall Street. Because of these long-term relationships between Wall Street and Washington, there was little serious consideration during the crisis of the possibility that a different kind of financial system might be possible— despite the exhortations of prominent economists such as Paul Krugman, Joseph Stiglitz, and many others. There was no serious attempt to break up the big banks or reform financial regulation while it was possible— when the banks were weak, at the height of the crisis. Reform was put off until after the most powerful banks had grown even bigger, returned to profitability, and regained their political clout. This strategy ran counter to the approach the U.S. Treasury Department had honed during emerging market financial crises in the 1990s, when leading officials urged crisis-stricken countries to address structural problems quickly and directly. As we write this, Congress looks likely to adopt some type of banking reform, but it is unlikely to have much bite. The measures proposed by the Obama administration placed some new constraints on Wall Street, but left intact the preeminence and power of a handful of megabanks; and even these proposals faced opposition from the financial lobby on Capitol Hill. The reform bill will probably bring about some improvements, such as better protection for consumers against abusive practices by financial institutions. But the core problem—massive, powerful banks that are both “too big to fail” and powerful enough to tilt the political landscape in their favor— will remain as Wall Street returns to business as usual. By all appearances, the major banks— at least the ones that survived intact— were the big winners of the financial crisis. JPMorgan Chase, Bank of America, and Wells Fargo bought up failing rivals to become even bigger. The largest banks increased their market shares in everything from issuing credit cards to issuing new stock for companies. Goldman Sachs reported record profits and, through September 2009, had already set aside over $500,000 per employee for compensation. Lloyd Blankfein, CEO of Goldman Sachs, was named Person of the Year by the Financial Times. The implications for America and the world are clear. Our big banks have only gotten bigger. In 1983, Citibank, America’s largest bank, had $114 billion in assets, or 3.2 percent of U.S. gross domestic product (GDP, the most common measure of the size of an economy). By 2007, nine financial institutions were bigger relative to the U.S. economy than Citibank had been in 1983.21 At the time of the White House meeting, Bank of America’s assets were 16.4 percent of GDP, followed by JPMorgan Chase at 14.7 percent and Citigroup at 12.9 percent. A vague expectation that the government would bail them out in a crisis has been transformed into a virtual certainty, lowering their funding costs relative to their smaller competitors. The incentive structures created by high leverage (shifting risk from shareholders and employees onto creditors and, ultimately, taxpayers) and huge one-sided bonuses (great in good years and good in bad years) have not changed. The basic, massive subsidy scheme remains unchanged: when times are good, the banks keep the upside as executive and trader compensation; when times are bad and potential crisis looms, the government picks up the bill. If the basic conditions of the financial system are the same, then the outcome will be the same, even if the details differ. The conditions that created the financial crisis and global recession of 2007–2009 will bring about another crisis, sooner or later. Like the last crisis, the next one will cause millions of people to lose their jobs, houses, or educational opportunities; it will require a large transfer of wealth from taxpayers to the financial sector; and it will increase government debt, requiring higher taxes in the future. The effects of the next meltdown could be milder than the last one; but with a banking system that is even more highly concentrated and that has a rock-solid government guarantee in place, they could also be worse. The alternative is to reform the financial system now, to put in place a modern analog to the banking regulations of the 1930s that protected the financial system well for over fifty years. A central pillar of this reform must be breaking up the megabanks that dominate our financial system and have the ability to hold our entire economy hostage. This is the challenge that faces the Obama administration today. It is not a question of finance or economics. It is ultimately a question of politics— whether the long march of Wall Street on Washington can be halted and reversed. Given the close financial, personal, and ideological ties between these two centers of power, that will not happen overnight. We have been here before. The confrontation between concentrated financial power and democratically elected government is as old as the American republic. History shows that finance can be made safe again. But it will be quite a fight. A beautifully written and powerful story that ties the current financial crisis to a cycle of politics as old as the Republic, and to a pathology in our politics that is as profound as any that our Republic has faced. We are far away from solving that crisis, and hopelessly far from even understanding how we could cure this pathology. Required reading for the President, and anyone else who cares for this Republic. Too many discussions of the Great Recession present it as a purely economic phenomenon–the result of excessive leverage or errors of monetary policy or algorithms--- run mad. Simon Johnson was the first to point out that this was and is a crisis of political economy. His and James Kwak’s analysis of the unholy inter-twining of Washington and Wall Street–a cross between the gilded age and a banana republic – is essential reading. 13 Bankers describes the rise of concentrated financial power and the threat it poses to our economic well-being. Over the past three decades, a handful of banks became spectacularly large and profitable and used their power and prestige to reshape the political landscape. By the late 1990s, the conventional wisdom in Washington was that what was good for Wall Street was good for America. This ideology of finance produced the excessive risk-taking of the past decade, creating an enormous bubble and ultimately leading to a devastating financial crisis and recession. More remarkable, the responses of both the Bush and Obama administrations to the crisis–bailing out the megabanks on generous terms, without securing any meaningful reform–demonstrate the lasting political power of Wall Street. The largest banks have become more powerful and more emphatically “too big to fail,” with no incentive to change their behavior in the future. This only sets the stage for another financial crisis, another government bailout, and another increase in our national debt. The alternative is to confront the power of Wall Street head on, which means breaking up the big banks and imposing hard limits on bank size so they can’t reassemble themselves. The good news is that America has fought this battle before in different forms, from Thomas Jefferson’s (unsuccessful) campaign against the First Bank of the United States to the trust-busting of Teddy Roosevelt and the banking regulations of the 1930s enacted under Franklin Delano Roosevelt. 13 Bankers explains why we face this latest showdown with the financial sector, and what is at stake for America. Simon Johnson and James Kwak provide the best explanation yet for how the smart guys on Wall Street led us to the brink of collapse. In the process, they demystify our financial system, stripping it down to expose the ruthless power grab that lies at its center. If you want to understand how Wall Street captured Washington and how it tenaciously hangs on to that power, read 13 Bankers. If the wads of money you’ve stuffed into your mattress for safekeeping don’t keep you up at night, Simon Johnson and James Kwak’s 13 Bankers will–a disturbing and painstakingly researched account of how the banks wrenched control of government and society out of our hands–and what we can do to seize it back. <==== BACK TO THE SHOW BUSINESS ARCHIVE for wannabe writers, producers, video documentarians, MAKE IT FROM ANY CITY ! <==== BACK TO THE NATIONAL SECRETS BOUGHT MEDIA WON'T REVEAL, AN INDEX PAGE. <===BACK TO l00 SECRETS YOUR GOV DOES NOT WANT YOU TO KNOW, EVER!